Twenty years ago Nedra Lindsay agreed to take part in a medical trial that involved wearing “[…] this up-and-coming device that was going to be used to detect breast cancer,” Lindsay said. Only 25 at the time, Lindsay didn’t think much of the instrument consisting of sensors and a small data pack that monitors changes in cellular structure (or tissue) over a 24-hour period. “I never thought it would be any use to me because I was so young,” Lindsay reported. However, Lindsay’s participation in the trial may have saved her life. During the course of the trial the device showed proof of developing breast cancer. Lindsay ultimately had a mastectomy and is completely cancer-free today. 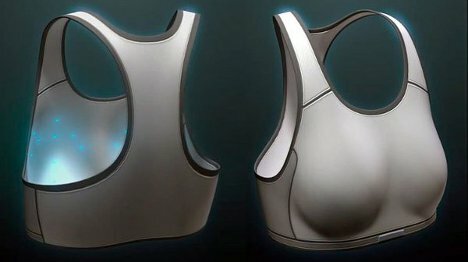 The contraption has been refined in the past twenty years and the wires and data pack have evolved into a cancer-detecting bra called the First Warning System. The First Warning System expects FDA approval in about a year (Q1 2014) and will cost consumers about $200.